​The parish of Box has a rich and interesting heritage. It is fortunate in having a number of buildings recognised as of national importance by their designation as listed buildings. These buildings of special and architectural and historic interest include Hazelbury Manor, which is Grade I listed. However, there are many other buildings which although not listed are of local architectural and historic interest. Like the listed buildings, these heritage assets are buildings which contribute to the special character of Box and an understanding of its history. This article refers to a group of such buildings with links to the quarrying industry history of the Parish. The three terraces of cottages are numbers 1–8 Mill Lane, 17-26 Fairmead View and 1–7 High Street. The terraces were constructed by the Bath Stone Firms Ltd who in 1908 – 11 became the Bath and Portland Stone Firms. All the cottages are located in Box Conservation Area, an area of special architectural or historic interest, the character and appearance of which it is desirable to preserve or enhance. ​Who were the Bath Stone Firms Ltd? Up until 1887 most of the quarries in Box and Corsham were independently-owned. However under the impetus of Corneilus Pictor (owner of Clift Quarry, Box) seven firms joined together to become the Bath Stone Firms Ltd. 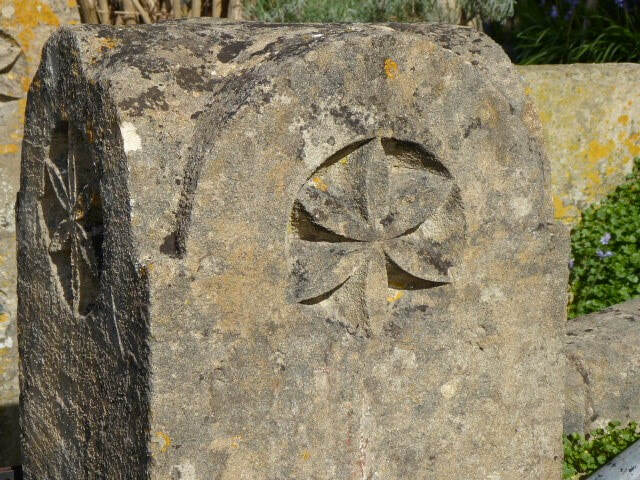 These firms were the Corsham Bath Stone Company Limited, RJ Marsh and Company Limited, Samuel Rowe Noble, Pictor and Sons, Stone Brothers Limited, Isaac Sumsion and Randell Saunders and Company Limited. The new firm increased production under their centralised control and took over the Portland quarries in 1911, when it changed its name to the Bath and Portland Stone Firms. 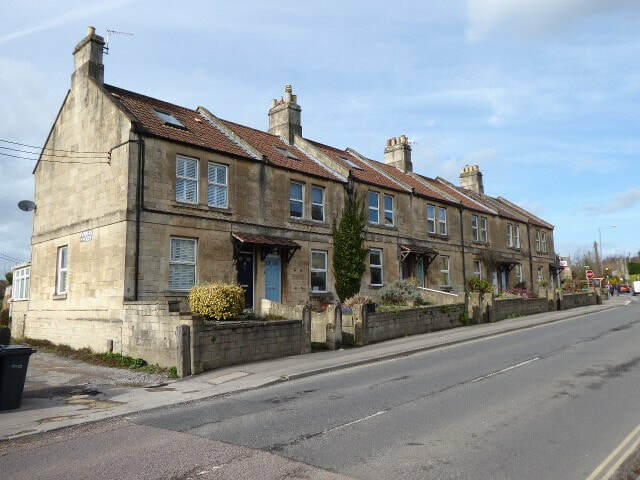 ​It was during this period of increased production that Bath Stone Firms Ltd decided to construct 42 Cottages in the village of Box. The site chosen was to the west of Mill Lane and between the High Street and Brunel’s railway bridge. Drawings for the proposed development, dated 1899, are noted below. The site plan notes the proposed demolition of Woodstock Cottages to enable the construction of five terraces of cottages, only three were built. Woodstock cottages were not demolished and are now protected Grade II listed buildings. They are described in the statutory list as Numbers 1 to 3 Mill Lane, cottage pair, extended, early 18th century in rubble stone with a stone tiled roof. ​Why were Woodstock Cottages not demolished? The title deed, which includes a map, (see above), also dates from 1899. It gives a clue as to why Woodstock Cottages were not demolished as it appears to show that they were not included in the final sale of land to the Bath Stone Firms Ltd. The original plan for 42 Cottages may have foundered on not being able to purchase the Cottages and its surrounding land. 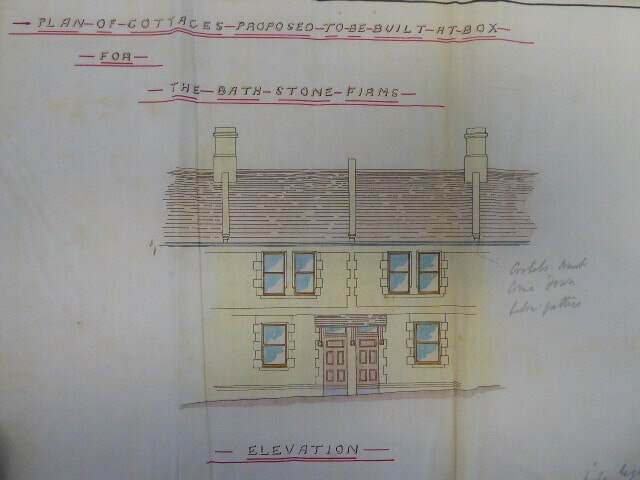 The title deed refers to the land being purchased for £750 by the Bath Stone Firm Limited, registered offices at Kingston Buildings, Bath, from Bertha Ponting, wife of Ralph Skeate Ponting, innkeeper at Box. Ralph Skeate Ponting was the owner of the Queens Head and several other properties in Box, including St Aldhelm's Villa and Lorne House. 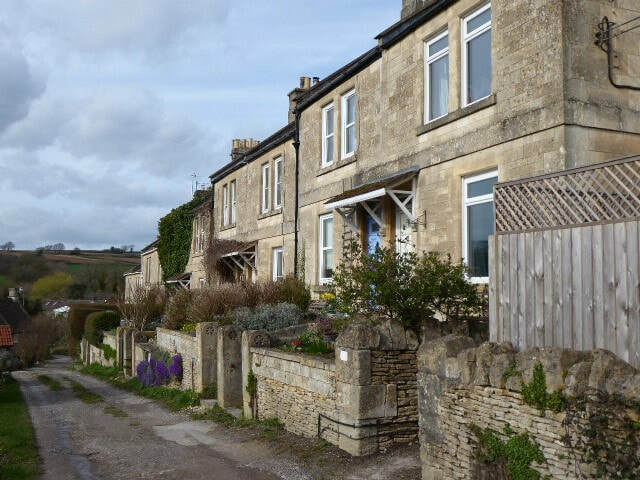 All the terrace of cottages and boundary walls constructed by the Bath Stone Firms and facing the road and footpath down to Woodstock cottages were constructed in natural limestone, with brick (it appears) being used in some cases for internal walls, the limestone perhaps quarried at Clift Quarry owned by the Pictor Family. The Pictors had already built two grand Gothic houses in the Parish of Box at Fogleigh House 1881 and Rudloe Park Hotel 1875 both now Grade II listed buildings. The central Box cottages help contribute to the study of the quarrying industry in the area and they were constructed with an attractive harmonious appearance using traditional building materials and details such as natural stone walls, clay roll tiled roofs, timber sash windows and timber panelled doors. ​The use of the same natural building materials, natural stone, and for most part details helped reinforce the attractive appearance of the terraces and gave a clue to the fact that originally they were built by one owner to an overall design. Fortunately original detail appears to still survive on some of the cottages such as the attractive painted timber panelled doors with their historic door furniture and accompanying overhead timber and tiled porches. ​Attractive five panelled historic timber doors, with an upper panel glazed, still survive on some of the properties with interesting historic door furniture. The same door design and furniture appears to have been an intended feature common to all the front doors on the cottages. Note the attractive bat motif on the letter Box which still exist on some Mill Lane, Fairmead View and the High Street properties. I wonder why the bat motif was chosen? There is an interesting link to the 21st century as bats are now also found in the deserted underground quarries in the Box area and are protected species. Traditional timber vertically sliding sash windows have been replaced with modern UPVC replacements, some appear to follow the historic design of the original and give a clue as to the type of window previously used others vary in design and method of opening. Natural stone front garden boundary walls remain a very attractive feature of some of the cottages in the terraces. Fairmead View and the High Street in particular have attractively detailed stone gate piers and tops of the same design with attractive stone motifs. A natural stone gate pier top to one of the properties in the terraces at Fairmead View and High Street. A common and attractive feature of the terraces. The historic plans for the terraces note that the rooms of the cottages had internal fireplaces which lead to the corresponding need for external stone chimney stacks. Stone built chimney stacks remain an attractive historic and architectural feature on the roofline of the terraces and the street scene. ​The illustration, right is a digi-painting with just a little artistic licence. 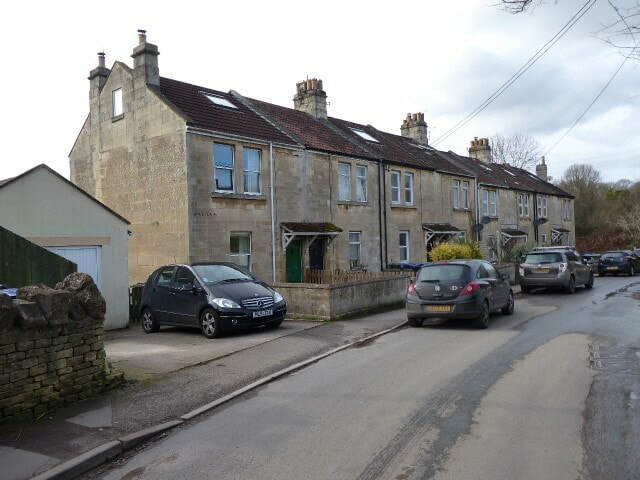 It could have depicted the entrance to a substantial residential area within the village, joining the attractive historic route in Box Conservation Area from the 18th century Woodstock Cottages, near Mill Lane, and then onto the historic footpath which takes you up past Fairmead View terrace one of the ranks of terraced cottages constructed by the Bath Stone Firms. But it wasn't developed in that way and today almost stands out as an anomaly in the road structure. In the next issue, we follow up this article about proposals to develop central Box with details of when the ranks were built (as opposed to just proposed), who lived in them and when the Bath & Portland Stone Firms sold them into private occupiers.